My portfolio consists of terrorism fiction, political novels, spy thrillers, political science fiction and sci-fi fantasy books. If you are interested in any particular novel of mine, you can order it online from the publisher and have it shipped to your door. All three of my books are available on Amazon.com. Click on the image of the book to access Amazon.com. This is the novel feared by the Obama Administration because it dares to show ordinary Americans, in unvarnished terms, what happens when Muslim extremists unleash a nuclear fire storm on the United States. Revolution, 51st Century, critically examines what happens to life as we know it because of the Administration’s policy of appeasement. The novel is set in the 51st Century following the cataclysmic nuclear attack of Muslim extremists on the US population centers, in waning days of the Swanson administration. Three hundred million Americans perished in the attack. Mass sterility and gene defects were the event of the day. The President ordered the Secretary of State to find a way to reconstitute the American way of life. She turned to gene splicing and genetic ladder engineering. The total focus of the country was on survival at any price. Democratic institutions and the arts withered. Three thousand years following the Great War, babies were no longer conceived in their mothers’ wombs. Birthing was done in a lab, with gene splicing aimed at creating units to serve the interest of the Secretariat. Democratic institutions had long since ceased to exist. The life span was extended to 150 years. Men and women no longer married because procreation was also done in the lab, and children were raised in Kinder Hauses. Children who were deemed unfit were harvested for their organs and summarily dispatched. On a routine training mission, Gaul an officer in the Combat Infantry Legion discovers the library. He was in shock when he read the thoughts of Thomas Paine. He came to the realization that the Secretariat must be overthrown, accompanied by the restoration of democratic reform. This is his story as he fights to gain what 21st Century Americans take for granted. It is a quest for justice in a cruel world that has little or no respect for the human condition. 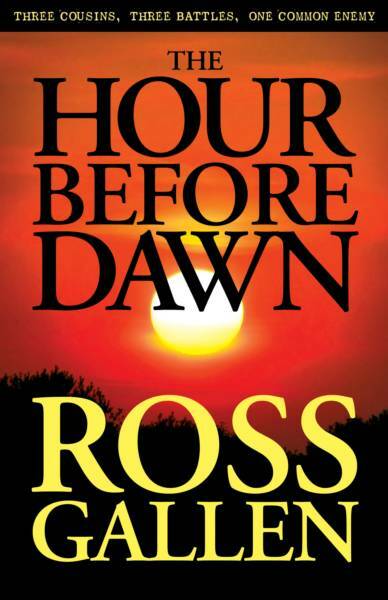 The Hour Before Dawn is a three part, multi-generational novel. It is the story of first cousins, separated by time and place, yet bound by blood and heritage. Adam, Jack and Sam Berlin are brought up to believe there is no higher good in life then to stand against tyranny and oppression. Each fight his own war and understands mere survival is insufficient. Courage to continue the battle in the face of total adversity defines the man. Belief systems may be shattered, but the inner courage of one man can change the course of life. Copyright 2011: Ross Gallen. Political Novels. All rights reserved. 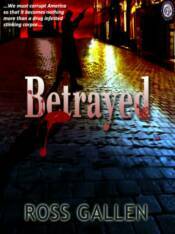 Betrayed is a spy fiction thriller centering on a conspiracy by the Iranian Revolutionary Guard Corp to distribute heroin and cocaine into the United States. The IRGC's purpose is to corrupt the West and provide financing for the Iranian Hegemony. As the plot unfolds an Iranian defector sends a computer disk detailing the activities of the IRGC to a U. S. Federal Court Judge. When the defector is discovered, the IRGC attempts to retrieve the disk. In the course of retrieval the Judge is murdered by a cleaning staff employee who is herself a Shia immigrant from Columbia. Grabbing the Judge's calendar, she proceeds to a safe house and is deprogrammed. The IRGC concludes the Judge transferred the disk to attorney Jake Mandel, who was his best friend. Mandel is a successful and cynical trial lawyer in Orange County, California. Against this backdrop, eighteen year old Wally Ovasi, a perfect tool, falls into the hands of the IRGC. His father is a physician, born in Iran of Shiite parents. Coming to America he changes his ethnic identify and poses as an Italian Catholic from Sardinia. He believes that to be an American means to be Christian and Western European. He lives and believes in the American dream. Wally discovers his father's Certificate of Naturalization. He questions his own identity and is angered that his father abandoned his Muslim origins and poses as a Christian. Determined to return to his roots, Wally joins a mosque and falls into the manipulative hands of the IRGC. He is molded into a resolute terrorist, committed to the destruction of the United States for perceived wrongs against the Iranian people. While participating in the bombing of Jake Mandel's office he is apprehended. He discharges his attorney, but does not deny the facts of his conduct. His defense is that he is a Muslim soldier defending the national interest of the Iranian people. Woven into the plot is the story of Jake Mandel, a lonely and skeptical trial lawyer whose life perspective and role as an unwitting participant in the events allows the reader a direct observation window. Jack, the eldest cousin, joins the Army Air Force and pilots a B-17 through 25 missions over Nazi Germany. He survives the war, only to find home is no longer a place he belongs. He returns to the peaceful English countryside. His heart cries out for Betty Goodman, his first and only love. He sends for her and steps into the fire of a destructive cauldron. Adam, the middle cousin, barely eighteen, moves to Israel to fight in its wars. Seventeen years later, on the Upper Syrian Plateau, he orders his men forward, although the map grid no long matches the terrain. His unit is ambushed. Wounded and bleeding, he is the sole survivor; a hero, who lives in the morass of his own guilt. Sam, five years younger than Adam, fights his war in the courtroom. He is the criminal defense attorney for Dr. Mark Renette, a prominent Orange County physician, accused of murdering his wife and her lover. Sam finally locates a witness who can alibi Mark, but Mark threatens to change his plea to guilty, if the witness is exposed and testifies. Sam is caught in the moral dilemma of saving an innocent uncontrollable client from the lynch mob of the jury and state imposed death by the needle.